Every entrepreneur and digital creator needs help - it doesn't matter if you're getting started in your journey, you're well on your way, or you feel like you're at the end and maybe haven't reached your destination yet. Yet, creating and running an online business is probably among the last few remaining career choices in the world, where people believe that they can just wing it - you know, watch some YouTube videos, listen to a few podcasts, join a few Facebook groups and online communities, and boom, one should be able to easily figure things out, right? Crowd-sourcing business advice is probably among the worst decisions you can make, because not only can it end up confusing you with all of the different answers and choices that your peers and fellow-members may throw at you, but it can also lead you down the wrong path, making wrong turns, taking the wrong decisions. And what's worse, it may hurt your growth and progress a lot more if you even tried to backtrack and revisit your decisions - not only will you not be able to reverse some decisions, but you'll be forced to stick with the wrong ones, because you're too far down the rabbit-hole. Every profession needs a teacher, a guide, a mentor, a coach. Athletes have coaches - whether on the court, or off the court in the form of personal trainers, dietitians, performance coaches, advisers and mental-health professionals. Actors, Singers, Entertainers - all have coaches, agents and professionals helping them with the flip-side of their talent - which is their business. Professionals like lawyers, doctors, plumbers, electricians all go through so much advanced (and continuing) education, training and internships. So if everyone tried to figure out everything on their own, and did not want to pay a teacher, trainer, adviser, consultant or coach, imagine just how primitive and far-behind this world would be! Imagine going through a legal battle with a lawyer who "figured out" the law on their own. Or getting surgery done from a doctor who "played one on TV". Or learning that the firefighters trying to put out a house-fire "learned it all by watching the movie Backdraft". And unfortunately, in the world of online business and marketing, because of how powerful and easy the Internet has made things for us, in terms of tools, software, services and self-help content and communities, every digital creator today feels like they can figure it all out themselves. Sure, you can. But just because you can, doesn't mean you should. There just isn't enough time in this world to try to figure out everything yourself from scratch, make all the mistakes, make all the wrong choices, make all the wrong decisions, and try to learn from all of it. And that's why it's better to learn from others' mistakes, then trying to make them all and learn from your own, just so you can say "I did it all on my own without anyone's help". There is no prize for foolhardiness. And that is why a lot of Entrepreneurs and Digital Creators fail at getting traction. They make uninformed, and sometimes misinformed, decisions. They seek advice from all the wrong places. End up getting the wrong advice, making the wrong decisions, focusing on the wrong things, and going down the wrong path. And before they know it, their business venture is struggling, they're not getting any traction, no one's buying, they're not making any money, they're running out of their savings reserved for their business, and worse, they're running out of time. And that's how 8 out of 10 small businesses end up failing. Yes, a whopping 80% of them shut down forever within 18 months! And while the obvious reason is that they couldn't make more money than they spent, if you look closer, that's only the symptom, not the cause. And the cause - or should I say causes - is usually poor choices, bad decisions, misplaced focus and priorities. So while it's fine to wing it if it's just a hobby, that doesn't work for your business. You cannot treat it like a hobby, and expect results like it's a business. And that's where a teacher, trainer, coach and mentor like me, can help. I've been selling online since 1997. And I've created and sold a wide range of products and services: Information products, Desktop Software, WordPress Plugins, Membership Sites, Online Courses, Ebooks & Kindle books, Audiobooks, Premium Podcasts, Agency Services (Marketing, SEO, Website & Membership Site setup), Webinars, Local Meetups, Consulting and Coaching. And regardless of where you are in your business journey, I can help you take it to the next level. I’m the Co-founder & Co-developer of DigitalAccessPass.com, a membership plugin & marketing platform for WordPress. I am a full-time entrepreneur (since 2010) living in sunny San Diego, CA, with my brilliant and beautiful wife Veena Prashanth (co-founder & co-developer of DAP, co-owner of our business), 2 amazing and precious kids, and a male dog inexplicably named Vanilla! I have a second podcast at CutToTheChase.fm: Business, Marketing & Tech Hacks For Entrepreneurs and Digital Creators. It is also available as an Alexa Flash Briefing. I’m a speaker – most recently presented at Podcast Movement. You can watch the first 3 parts of my presentation for free. I've been selling online since 1997. I launched my first web site in 1997. I was the first Indian (back when I was still living in India) to sell a physical book online to an international market, back in 1998. 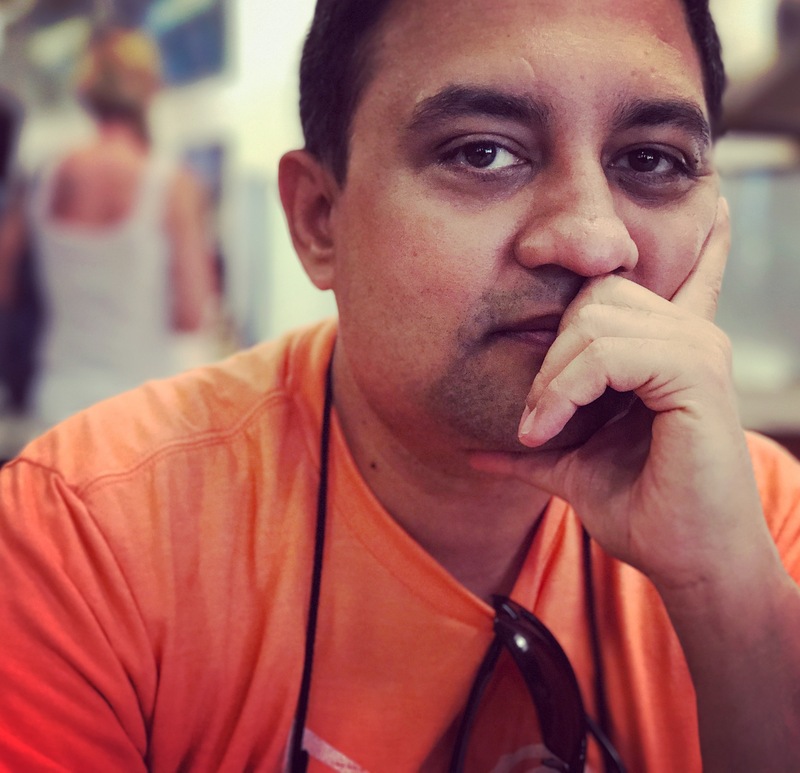 After failing at two brick-n-mortar businesses in India, I started looking for better opportunities in the online world, and I moved to New York in 2000, taking on a programming job at a dot-com company (remember the boom?). In 2007, I wrote my first real book “No Business Like E-Business” which went on to become an Amazon category best-seller at the time (don’t buy it now – it’s outdated right now – coming up with a new edition soon). Not many business coaches can match my resume, in terms of the sheer number of things I've sold, the kind of audiences I've built, the creative and technical stuff I've done to promote my products and services, and most importantly, the success I've had with a wide variety of products and services. I'll help you grow your business. I will work with you for 1 full month. No limits on Calls, Chats or Emails. I'll hold you accountable, but results will be up to how you execute. I will work with you for 1 full year. No limits on Calls, Chats or Emails. You pay for my Coaching. I'll help you grow your business until you earn back what you pay me. My Coaching is ESSENTIALLY FREE! 1) & 2) Unlimited Coaching for 1 Year or 1 Month : You pay for my Coaching. I'll work with you for the entire duration, with no limits on the number of calls you can have with me, number of times we chat in a private Slack group I create for us, and no limits on number of emails you can send me. I will work with you for the entire duration that you've signed up for, to help you figure out ways to grow your business. You then go and execute them. I'll hold you accountable, for sure. But in the end, the results will be entirely up to how quickly and efficiently you execute. If you do nothing with what we talk about on the calls, and if you don't execute, then you won't grow. But you have full control over everything. 3) Guaranteed-Results Coaching (aka "ESSENTIALLY FREE"): You pay for my Coaching. I'll work with you until you you've earned back what you paid me - and that's over and above what you're currently making from your business. So there are is no ceiling on how many hours of my time you get. I'll work with you and help you for however long as it takes for you to earn back what you paid me. A majority of the responsibility of helping you execute and holding you accountable, falls entirely on me. Which means, there will be milestones, deadlines and homework. If you want guaranteed results from me, I want guaranteed commitment and execution from you. Obviously, if you run into unforeseen issues, like health, family issues and the economy. I'll make exceptions for those. But laziness and procrastination are not allowed as an excuse. If I asked you, on a scale of 1 to 10, tell me how badly you want to do well and get to the next level, and if you answered "11" (eleven), then this is the option for you. And seeing you this pumped would get me equally pumped up to be able to work with you. Everything I read, write, watch & think about: Business, Tech, Media, Mind & Marketing. Relevant and riveting, news, events and commentary from 'round the web. In one place. Once a week. Delivered straight to your Inbox.